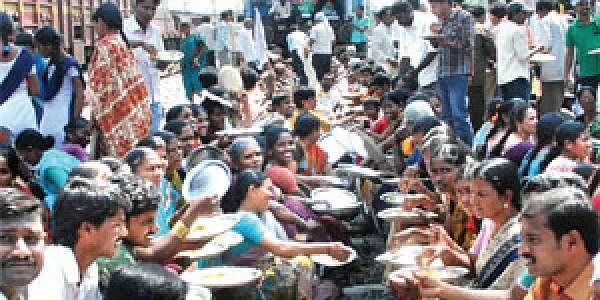 Pro-Telangana activists have community lunch on the railway track at Hasanparthy in Warangal district on Tuesday. HYDERABAD: A group of women were playing Kabaddi and a few others were immersed in a serious game of cricket. Another group was busy cooking while artisans displayed their professional skills -- all in front of the Godavari Express on a railway track. Soon a tent too was erected while some men rode motorcycles on the tracks as the area reverberated with slogans like ‘’Galli mein bolo, Delhi mein bolo, Jai Telangana.’’ This was no afternoon picnic of course. It was part of the rail roko, a brainchild of Telangana joint action committee, staged across the region on Tuesday. The fun and frolic was matched by an equal measure of agony and irritation of those unfortunate enough to catch a train. At the crack of dawn, the T activists converged on the tracks at Moula Ali, Ghatkesar, Medchal and several other stations with utensils, bed sheets, tents and what not, bringing the rail network to a screeching halt. The same scenes unfolded in Warangal, Khammam, Karimnagar and Adilabad districts. There was a solitary jarring note among the protests. In Jammikunta, an Intermediate student attempted self-immolation and suffered 70 per cent burns. TRS MLA K Taraka Rama Rao led a massive demonstration at the Moula Ali station, where the Godavari Express from Visakhapatnam was stopped in its tracks forcing all the passengers to hit the road. The train services were hit the hardest in Nalgonda district where several trains were halted near Bibinagar and Ghatkesar. Passengers of the Narayanadri Express had a tough time as the train was stopped at an isolated place, far from the railway station. The passengers, bound for Secunderabad, were seen walking a few km along with their kids to find an auto to a nearby bus-station. But the T leaders justified their rail roko call. “In a democracy the only means of expressing one’s frustration is a peaceful protest,” Rama Rao reasoned. TJAC convener M Kodandaram participated in the rail roko near Ghatkesar.